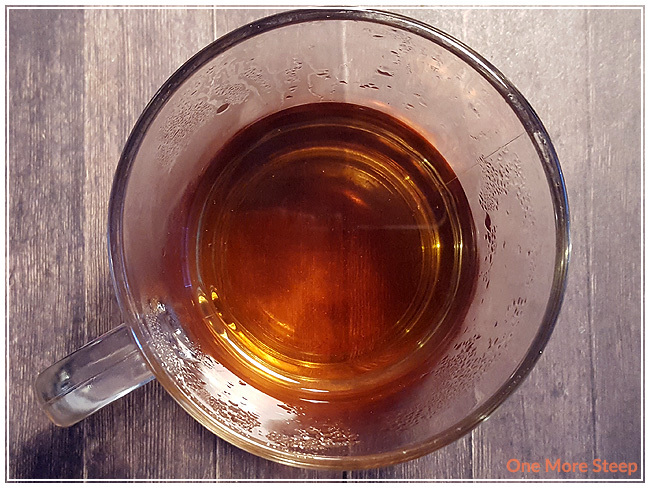 I was super excited to see that Day 7 of the 24 Days of Tea advent calendar was an oolong tea! And then I smelled it and I was just overwhelmed with the heavy spice aroma from this little tin of tea. I couldn’t even see the oolong until I started shaking it out into my stainless steel tea infuser because of the giant chunks of fruit. Honestly, the first thought that went through my head was “What’s all this stuff doing in an oolong?!”. There’s a heavy cinnamon smell to this tea blend. 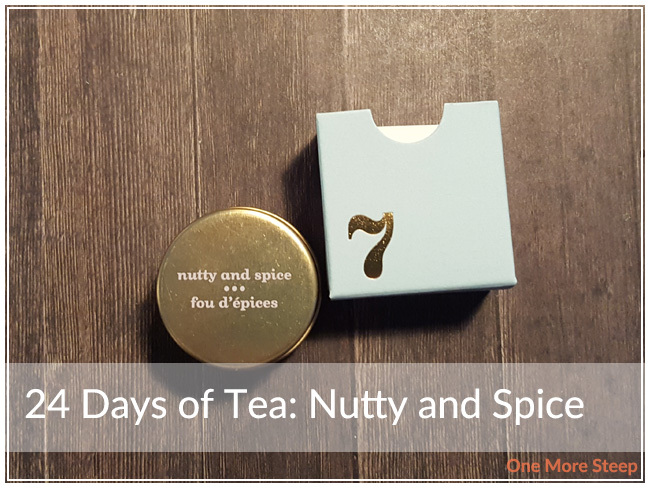 Nutty and Spice’s ingredients are: oolong tea, roasted chicory root, pineapple, papaya, cinnamon, walnuts, ginger, apple, rose pepper, roasted almonds, cardamom, almonds, pistachios, cranberries, rose blossoms, natural and artificial flavouring. The calendar packaging recommends steeping Nutty and Spice for 4 to 7 minutes in hot water, this is the same as the online product page where hot water is 75-80°C (167-176°F). I steeped my cup for close to 4 minutes. Nutty and Spice steeps to a nice golden orange, the first thing I could smell while it was steeping was the cinnamon. Unfortunately, the first thing that I could taste when I was drinking it was the cinnamon. I could not make out the oolong base at all – I’m assuming it’s there because I can physically see it and pick it out from the rest of the ingredients. It has a very “warm” flavour profile, the mix of spices is almost comforting in a way with how they just warm you up from the inside out. Unfortunately, that’s not what I look for in an oolong – especially all that cinnamon. I attempted to resteep Nutty and Spice a second time and was disappointed as it was kind of this watery messy that sort of resembled a cinnamon stick. 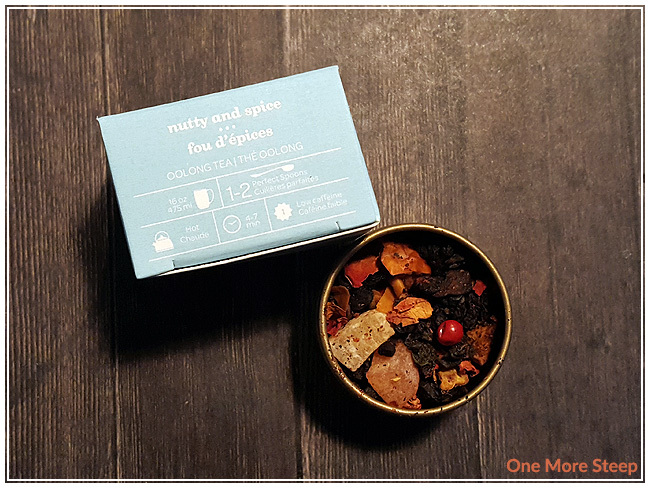 I didn’t like DavidsTea’s Nutty and Spice. I really like oolongs, generally speaking, and the additives thrown in here don’t do the tea any favours. 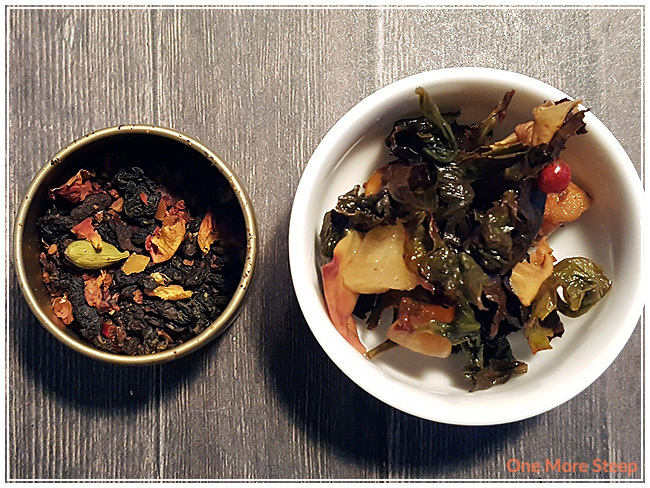 I find that the spices are very heavy in the flavour profile and effectively drown out any flavour that the oolong base would have added to this tea. On the other hand, I wish that some of these spices had made their way into day 6’s Apple Cider for more of a mulled apple cider flavour.